: Latest update: Student uploads! Update 12/16/2011: This process has changed slightly and a new video has been recorded to cover the latest version of the student upload process. At NCTE a lot of teachers asked us if we could have students upload their own essays. At the time - last weekend - the only option was to have teachers collect and upload the documents themselves. Not ideal. I began telling people that my goal was to support student uploads by this Friday (today!). I said it to enough people that I realized it was now a promise! So I made good on that promise. The upload URL contains a five-character code that is unique for each assignment. 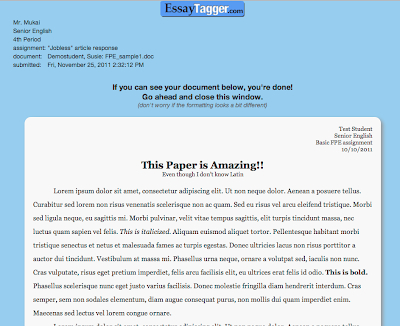 Simply provide this link to your students and they'll be able to hand in their assignments online themselves. 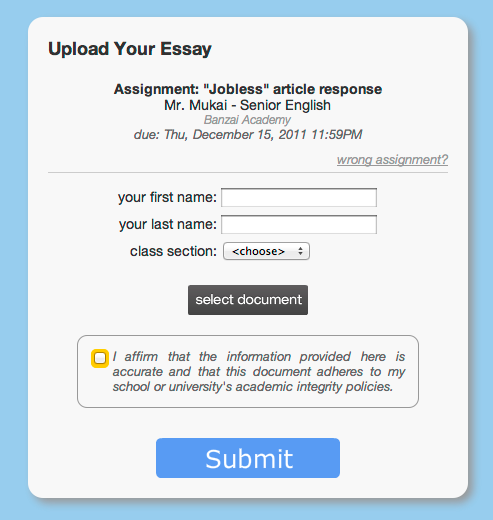 You can also still upload documents for the assignment yourself. No student login is required; the link goes straight to the upload page. We ask for their first and last name so that you can identify whose work belongs to whom once it's uploaded. They also must specify the class section they belong to so you don't have to sort through them later. I also added a checkbox that basically says "I swear this is my work." It won't stop plagiarists, but it's one more piece of leverage you'll have over them. All fields are required and they cannot submit until they have been completed. I also built in a lot of safeguards against bad document files and incorrect file formats. I had a lot of problems with this on moodle when I'd go to open a kid's document and it was all garbled or in a format I couldn't open (e.g. ".pages"). I didn't want to relive that here. For starters the "select document" button will only allow students to select a DOCX, DOC, RTF, or TXT file. These are the only formats we are currently able to support. At this point they can see their document and confirm that there weren't any errors along the way. 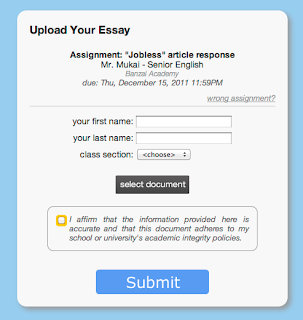 Each essay is also timestamped with a submission date/time so you can see who was on time (due dates are configured in the Assignment setup). Submit time is set by our server - not the student's computer - to guarantee consistency and integrity. Students can upload their document multiple times if they have revisions - you'll just see multiple copies listed under their name with different submit times. I recommend that you try out the process yourself and demo it for your students in class. You can easily delete the test documents you upload. As with everything on the site, I tried to make this as foolproof as possible - which is an added challenge when you're talking about asking students to follow instructions! **Note: We attach the students' first and last names to the document filename but we don't yet support full student integration into the site. That'll take a bit more work but is a high priority on my to-do list. Each assignment has a different, unique upload link. Tell your students to wait for the confirmation screen. You can still upload documents yourself if you need to. 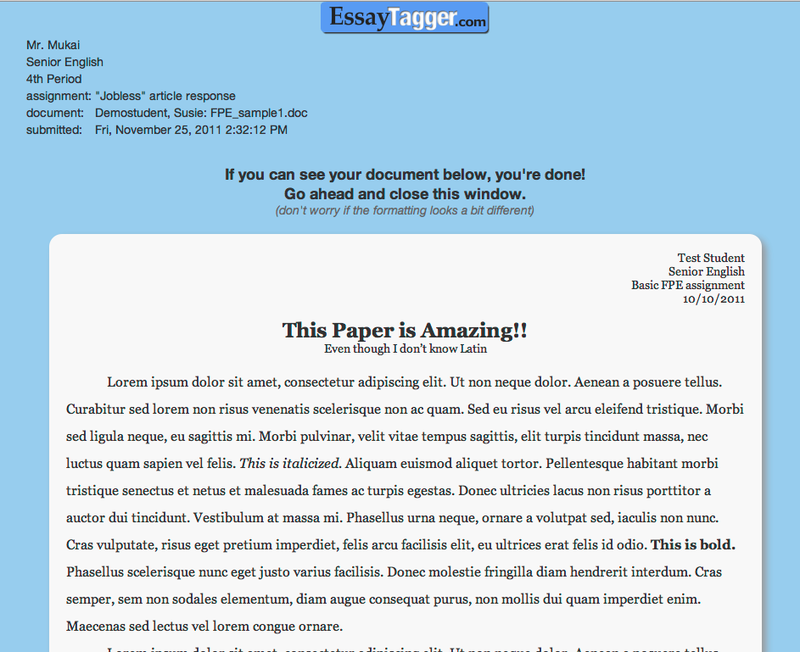 The site supports DOCX, DOC, RTF, and TXT files.